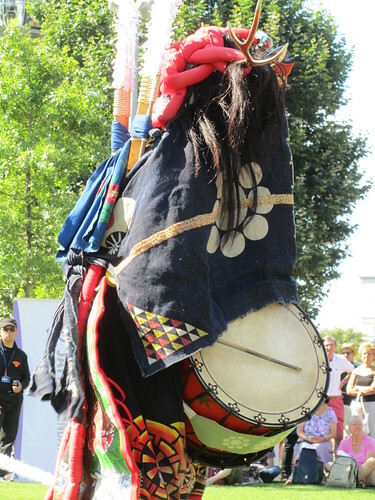 Last Sunday, 9th September, it was a beautiful late summer’s day and I went along to the Thames Festival in London to see a Japanese folk dance called Shishi-Odori (Deer Dance). 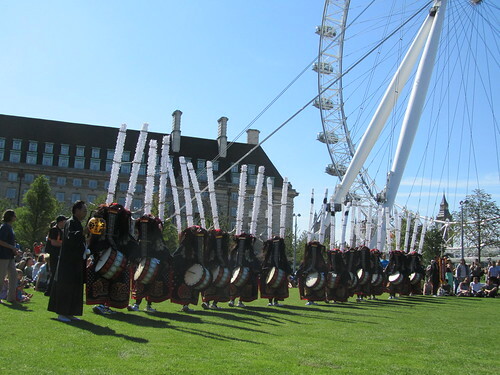 The dance was performed by the Oshu Kanatsu-Ryu Shishi-Odori Rengokai (Oshu Kanatsu Style Deer Dance Joint Association), and it was the first time they have ever performed in the UK. 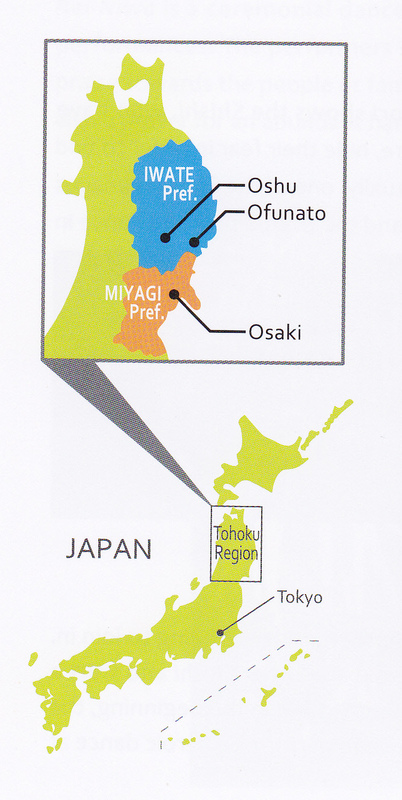 The Kanatsu-Ryu (Kanatsu Style) of Shishi-Odori is said to have originated during the Edo period (1603 – 1868), when the Shishi-Odori was passed on from Miyagi Prefecture (宮城県) residents to the city of Esashi (now Oshu City / 奥州市), and to this day has been handed down through generations as a religious performing art. 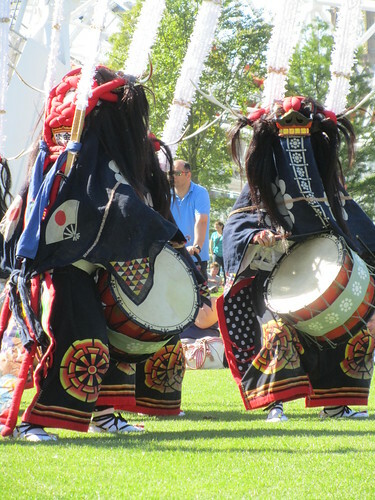 Although numerous dance troupes have formed and disbanded over the years, the dynamic Kanatsu-Ryu has continued and remains one of the leading Shishi-Odori styles. 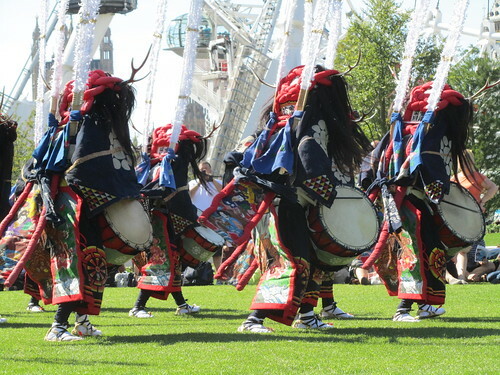 Kanatsu-Ryu troupes, beginning with Kanatsu-Ryu Yanagawa Shishi-Odori (Yanagawa Deer Dance Troup), which is a designated Intangible Folk Cultural Property (無形民俗文化財) of Iwate Prefecture (岩手県), have presented their dances at various places in Japan, the US, Russia and Bulgaria. 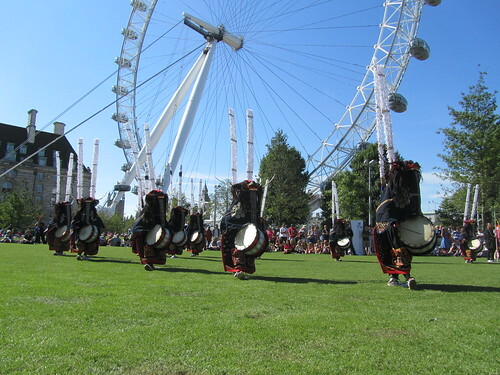 The performers invited to the UK are members of the Yanagawa, Ide, Karuishi, Urahama and Matsuyama dance troupes which represent this tradition, deriving from Oshu and Ofunato cities in Iwate and Osaki City in Miyagi. When I first heard that this event was going to be taking place in London I was very excited – especially when I saw a picture of the dancers’ costumes. It’s very rare to see such a unique, traditional event outside of Japan, and the costumes worn for the Shishi-Odori are really something else (I can’t image what it cost to bring them all over here!). Each dancer’s the costume includes two 240cm long Sasara made from bamboo and Japanese paper, similar to those you might see being used by Shinto priests at a shrine in Japan. 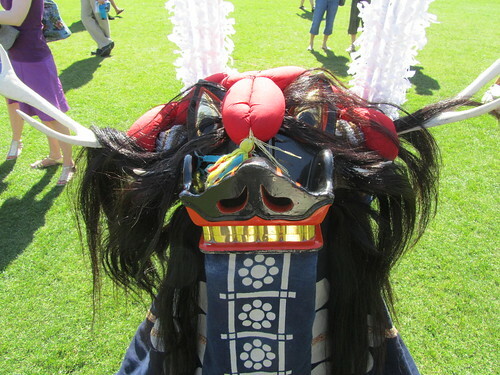 There is also a mask, called a Kashira or Shishi-Gashira mask, which is shaped like a lion’s head but has deer antlers attached to it. 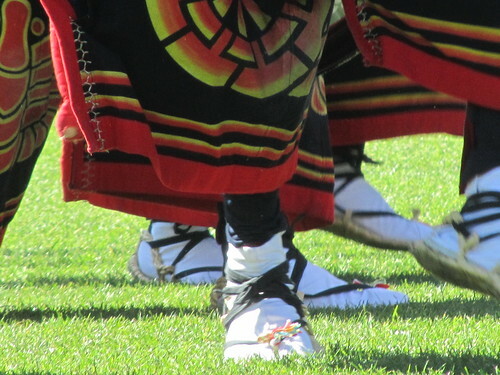 The dancers’ faces are covered over with a Maku (cloth), but they can see through it. 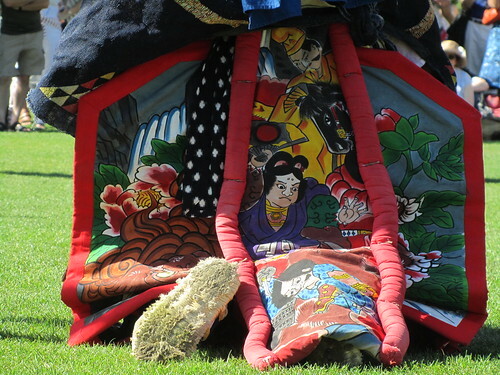 Kanatsu Style dancers use cloths with the Kuyomon (‘crest of nine circles’) dyed on both sides, which is a family crest of the former lord of this region. 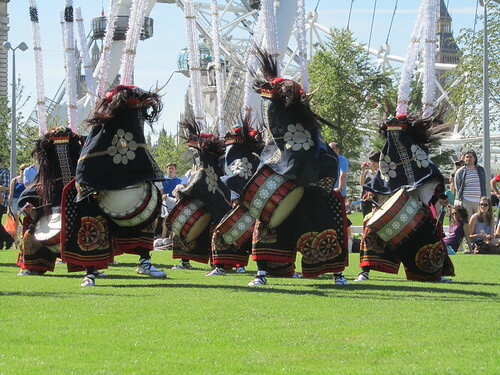 Some dancers also carry taiko drums of varying sizes. 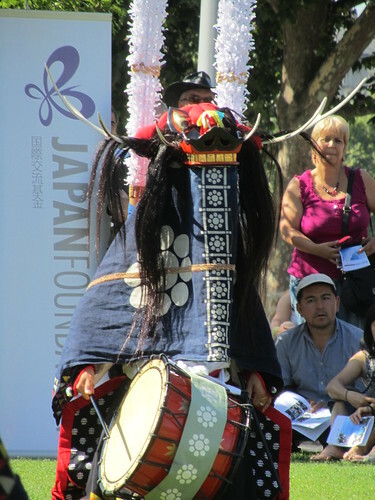 The Shishi-Odori event was brought to the UK with the support of the Japan Foundation, and much of the information in this post comes courtesy of the incredibly useful information booklet which was handed out by the Japan Foundation at the event. 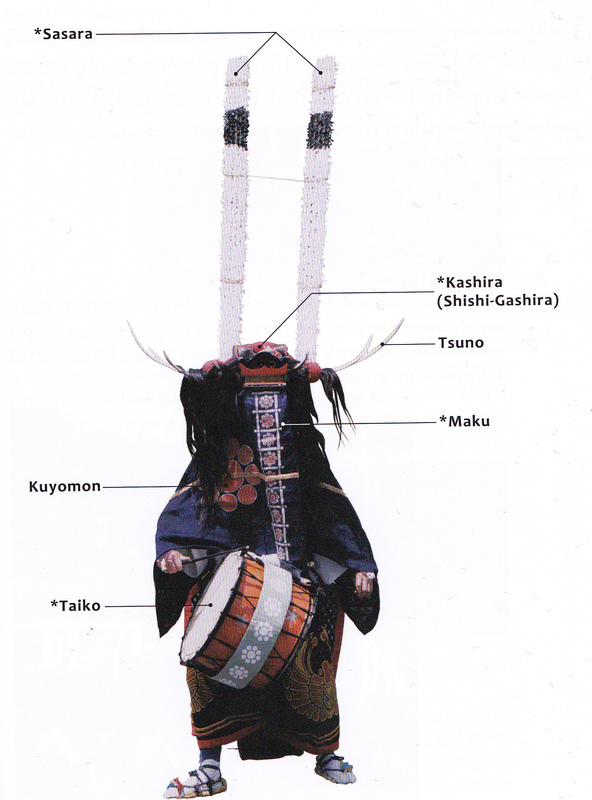 The above image showing the parts of the dancer’s costume and the map of Japan are scans from this information booklet, but all other images and the video in this post are my own – you can see the full collection on Flickr.